This is an actual size boy scout shirt. For this cake I made 2 chocolate sheet cakes. I used the an entire one to fit the torso; the 2nd one, my husband carved it to fill the sides and the upper part and the sleeves. 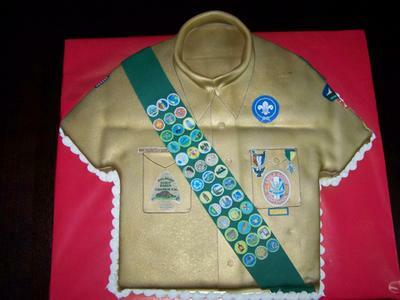 The sheet cake was too narrow for the shirt size that I want it that's why we had to put some more cake to fill in the torso. The cake was 27" long and 25" wide. I covered with chocolate icing and then I covered with fondant. I made the pockets, buttons, side sleeve pocket, and neck collar with fondant and I had to let the fondant ( the neck collar) dry overnight. 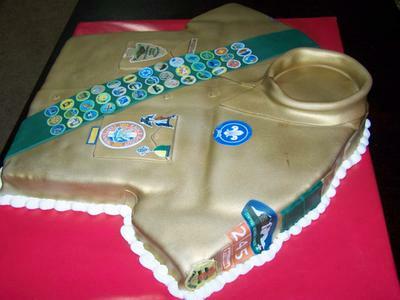 The next day, I airbrushed the cake with a mix of gold sheen and few drops of brown color, to create the khaki color that the boy scouts uniform has. This was trial and error until I got the color I was looking for. I made the green sash using wilton's juniper green color, it gave me the mossy green color I was looking for. Then I started to add the merit badges on the sash. They were 36 merit badges only on the sash. I printed them with my cake printer. They were placed on the sash in the order the boy scout earned them. I made the others badges, ribbons, medals, US flags on the sleeves, troop information and placed them exactly as he has on his shirt. OMG I was not aware that a young man could achieve so many accompishments. On top of it, he will eat them too, brilliant. Well thought out cake. Oh My God, this cake is huge and so meaningful. I'll bet the honored scout loved it. You are very talented. YOU ARE GOOD THAT IS AMAZING..